Ads on bus shelter kiosks and newsstands around the Manhattan campus. An NYIT wrapped double-decker bus that circles Manhattan (going past the Fifth Avenue museums, Columbus Circle, and Lincoln Center, and traveling as far south as Wall Street). A 30-second video about the university (see below) that will be distributed digitally in Manhattan and within a five-mile radius of the Old Westbury campus. This effort is only phase one of an integrated brand campaign across traditional, digital, and social media, which is designed to showcase our outstanding faculty and the ways in which our inventive, curious, and creative students and alumni are making a difference and determining their own destinies. Stayed tuned for more. 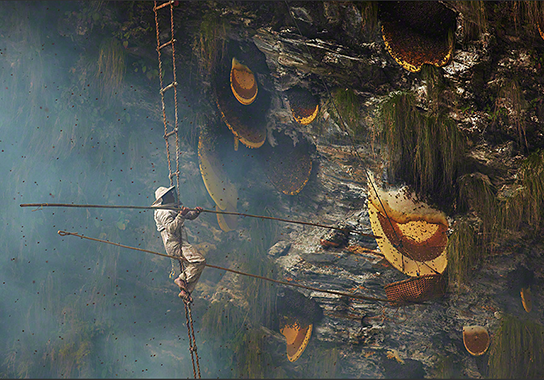 High in the Himalayan foothills of central Nepal Gurung honey hunters gather twice a year, risking their lives to harvest the honey from the world’s largest honeybee. For hundreds of years, the skills required to practise this ancient and sacred tradition have been passed down through the generations, but now both the number of bees and traditional honey hunters are in rapid decline as a result of increased commercial interests and climate change.